awesome code. !.can u plz post the total project code for an contact app..i'm working on a project on this..bt i am stuck at listview..i am not able to display the contact names in the listview dynamically from the database..can u help? hello manish...its shows only text view ...?whats the problme..? Are you testing on phone or on emulator? and do you have phone contacts there? how to get all contact details? like organization,region,city,country ? 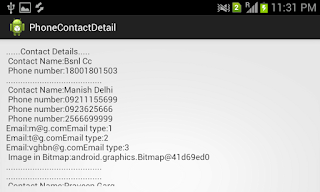 yes you can get all data from contact detail what android provide us. just use constructor of ContactsContract.Contacts like below, i am getting id. just replace _ID with your key. And please change type of int i1 to what you needed like String, Boolean etc. note: you can get only that data what android provide us. Thanks for the code. But the scrolling functionality is not working. And i am not getting all contacts. Can u please help me? Just change your Relative Layout to ScrollView and if it not allow because scrollview only can have one direct child then add your Relative Layout inside Scroll-View and it will work fine. Can u plz tell me, how to add a scroll view in the layout bcoz im new to android. Thanks in advance. Thanx for your reply. Now it's working fine. Can you help me with Source code to how to get GSM Signal Strength in Android? And don't forget to add permision in your manifext.xml file for telephony manager. One more thing i want to clarify. It is displaying the list of contacts in a xml file. But i need to enable the call functionality to that numbers. Is there any possibility? Please help me in this regard. Thanks for the post. Can you help me to retrieve contact details of a particular number. It will append only that contact detail..
i want get mob no bt this code is not working..
@Praroop- Telephony Manager does not guarantee to get the user mobile number, so kindly refer other method like take input from user and validated it using SMS. I think there is no way for below API level 11. Well if you got anything please let me know, I am looking for it. Can you help me by providing a source code to play a video file in Android through wifi. Awaiting for your response. Hi Mahesh, your question is interesting and challenging too. So how do you want play video? you want play your android device video from outside using any device or something else? Sorry for the delay. Actually i have an wifi URL. And i want to play it in my application. And actually the requirement is i want the source code for Youtube functionality like in Landscape mode when we press an icon then the video will get stretch and when we again press that icon then it will come to normal state and vice versa. I want the total source code for it. Can you provide me? Awaiting for your response. Can any help me why this crash report is coming. Am not getting bitmap image, it showing just like Bitmap.android.graphics.Bitmap@4b84533 . hi manish can you please tell me how to avoid duplication of numbers in the list. I am able to populate all my contacts in a list view using a custom cursor adapter now i want to just display one number once be it defined as 01234567890 or +911234567890 or 1234567890.
can you plz tell me how to get contact added date and time or last update time when contact modified.. I don't think you can get last modified date and time. If you got anything please let me know, i am interested. it should work. please recheck my demo code. If any crash report please share with me. its depend on your data, no one can calculate it. May be it solve your problem. Is any exception here? I never try it but it should work. You are trying with action bar tab or old one? If using action bar then just bind your map into fragment. Error is: "phone contact detail is stopped"
Try to call readContacts(); method inside Async task class. If you have given permission in manifest and everything ok then only main thread issue might be here so use background thread to get contact detail. hello, i just want to get all contact name, number or photo of contact in listview. Hi Thanks for the great Example Manish, I am getting images and contact numbers fine but both are not coming simultaneously.. please help me.. Working Code,thanks.But taking around 5 secs to load 100 contacts in my phone.can't something be done to make it fast!! Fetching the data from phone will take some time, so till then you can show progress dialog. There was problem with contact image. Image work above the version 11. You can make a check in your code over the get uri of image. this is one awesome tutorial,works like a charm. now i want to add List view in the same code,have tried but no luck yet :/ Can u help? thanks in advance :) keep sharing awesome tutorials. The code works fine, I can able to find my contact lists in the Logcat through SOP statements, But I'm wondering why this doesn't appear when I run the application in my mobile. greate example - in my try it fails on "textDetail.setText" do you have any suggestions ? Iam not a programmer, but I would like to have this app (view contacts with name, number and picture). kindly suggest an app if it is available on google play. Step 1- Get all the phone contact number and their unique Id and send it to server in service class so user did not know about background process. Step 2- Server side you need match all the database with your numbers list and return true for which number into your server database and false for other. 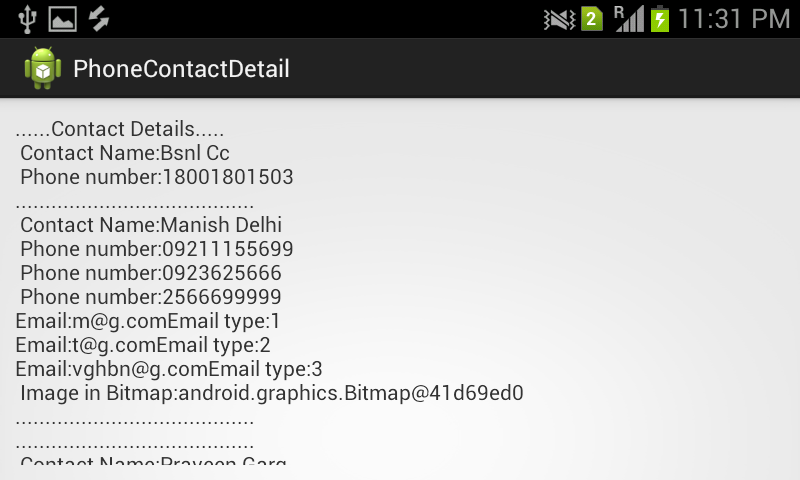 Step 3- Now at Android side you need to display that number from your phone book which status is true. Step 4- And for future if some one add any new contact in their phone book just you need to use broadcast receiver for add new contact and send that contact on server i background and match with server data. I think that's all you have to do. dear sir i want to fetch all the phone calls and messages in android app and i want after every 24 hours all detail goes to my mail....hoping best response. 1)Write a web service for sending all history on server. 2)From server side you can store it into database or you can email all data to any email id. 3)At client side on your phone you need to implement Alarm Manager which will send data to server after every given interval(like 24 hour). No you are wrong, using server you can access to all users record with their unique phone id and sent it to where you want. You can purchase server email to send email like you revived many email from advertising company so they are using a mail server to send email. And what you are planning to use phone email and hide the app and all not possible. Android does not allow us to do it for security reason. Think by yourself if any application like Facebook sending email using your Gmail to anyone is it good thing? Or is it possible? Answer is no. It will go inside if condition only if contacts have phone number. but What about images? It's not showing. from here you will get the image URI then use image downloader to display them. This awesome tutorial. But if there is a 5000 contacts in a phone , its slow at the first time of loading.I just fetch name and image .but when the size goes to 3000 to 5000, it is slow. can you please give as an idea for fast fetching. Hi Binil, I never tried with large number of data but I hope Lazy Loading and Async Task should help you. I have the above code. I am trying to display the contact list by sending it to adapter. everything is working fine am getting name,phone no. and image. problem is am not sure how can i place default image. if i dont have image in the contact list. Please help me in this. Manish Sir..i created.netwebservices to fetch the vehicle details(i,e)id,name,phneno,chasis no..etc from SQL database..i want to fetch these details from webservices ..And details should come within listview while clicking onclick btton .please help me sir..
after which adapter i have to use?????????????????????? anish Sir..i created.netwebservices to fetch the vehicle details(i,e)id,name,phneno,chasis no..etc from SQL database. webservices details . should come within listview while clicking onclick btton .please help me sir..
can u make a help? Hi Manish,How to get TYPE(Mobile,Home,Work,Work FAX, Home Fax and Other etc) of mobile number. can anyone help me ...i want to do email task in everyu 1 hour without opening an app...somebody??? and then i got errors for "Contacts" , "CommonDataKinds" , "textDetail"
whats the problem? what should i do??? Please check your package name, it's seems R error. Please check your import for R.java. Mr Mainsh how to create ap app who record the android screen ? As per my understanding you can't create a screen recorder app but above version 4.0 you can record your screen using adb command. In this case your phone must be connected with eclipse or android studio. Google for step to record your screen using adb command. did you try with text/video? Hey i have to send all these contacts on a server.and i have to send in json format. hello, Manish, I need android code to send contact details to my email or any other phone number. I would like to help getting this code. 1) You can't send contact detail direct to email address for this you need to write web-services and then using email server you can send it anywhere. 2)You can send it over the sms in background but there are a lot of contacts and our SMS limit is 160 char so it will charge a lot so think before to implement it. All the code are above, do what you want to do with it. in the image? I am not getting you. I guess you want use numbers as CHEPTA right? Well you can write number in any textview and you can take screenshot of that programmatically and you can use it where you want.